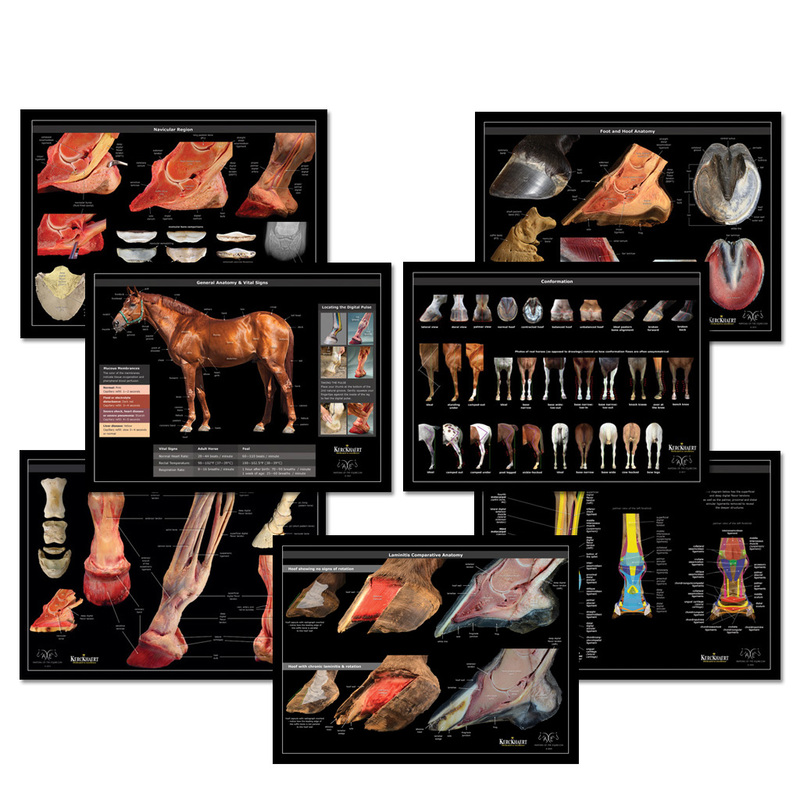 Our stunning horse anatomy posters* are printed on 100 lb paper stock with a UV gloss coating which make them both durable and visually beautiful. 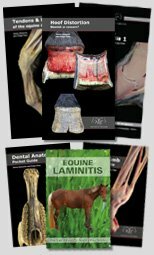 Perfect for the class-room, clinic or truck. Click on the images below for a larger view or scroll down the page for more detailed information on each poster. Order seven posters and get them at the reduced price of $12 each. Choose from either six of the same poster or one of each. 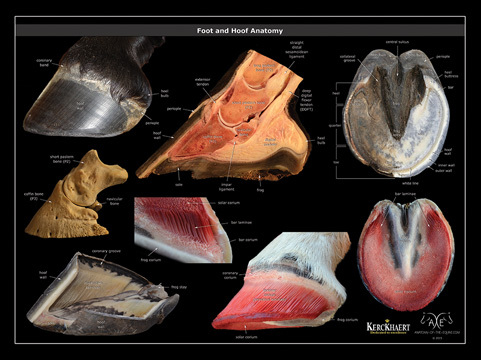 The laminitis poster compares a hoof with severe rotation to a normal hoof. 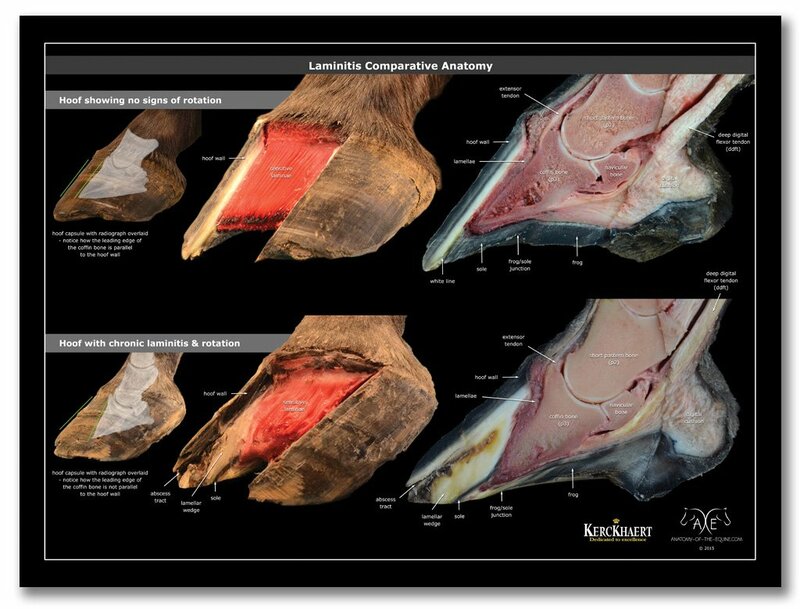 It clearly shows how the lamellar wedge fills in the gap between the disconnected hoof wall and highlights the damage that chronic laminitis causes. 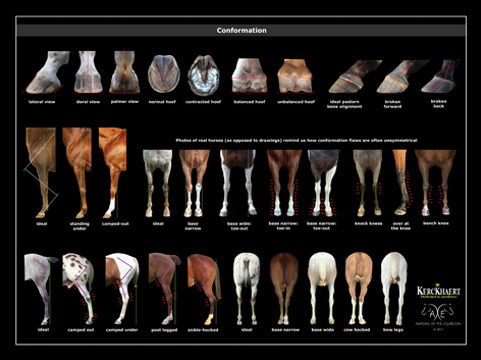 The conformation poster shows common hoof and body conformation traits. 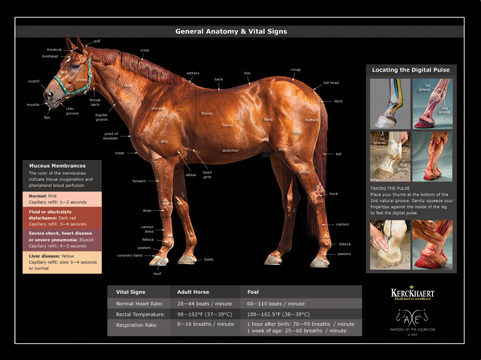 The general anatomy poster shows the overall anatomy of the horse as well as the vital signs such as heart rate, rectal temperature and respiration rate of both adult horses and foals. It also features the mucous membrane color chart and instructions on how to locate the digital pulse. 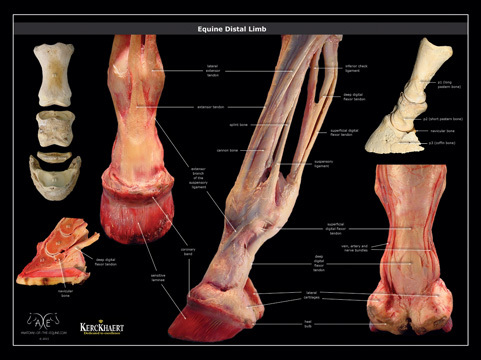 This poster shows both the external and internal structures of the hoof including the hoof wall, bar, frog and sole coriums. 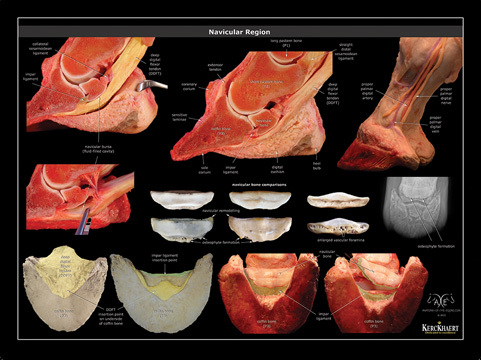 The navicular region poster shows the various structures in the navicular region including the navicular bone itself; the deep digital flexor tendon; the impar ligament; the navicular bursa; as well as the arteries, veins and nerves supplying the area. It also compares a relatively healthy navicular bone with one that has undergone remodelling and shows what the remodelling looks like on a radiograph. 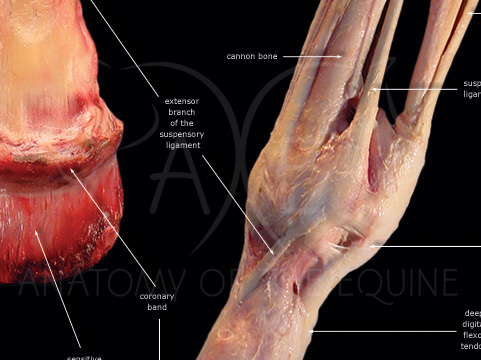 This poster depicts the dissected equine distal limb. 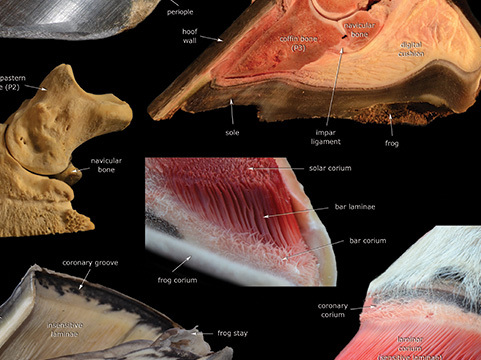 The lateral, dorsal and palmar views, highlight the structures below the level of the skin and hoof wall. 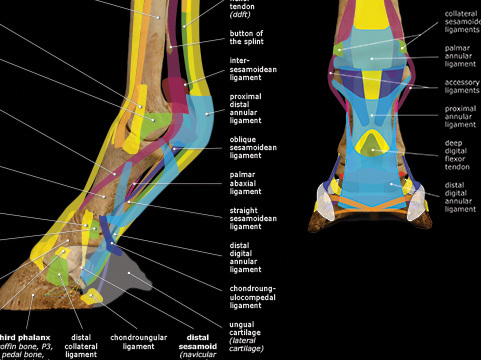 It also shows P1, P2, P3 and the navicular bone plus a sagittal cut through P1, P2 and P3. 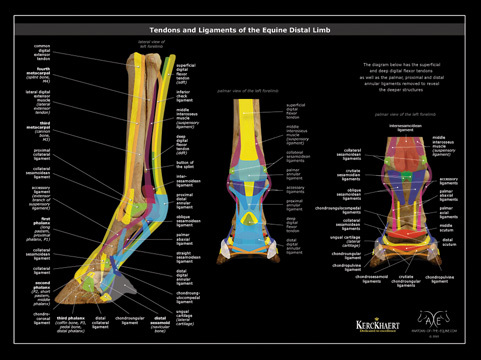 The Tendons and Ligaments Poster uses a combination of real bones overlaid with illustrations to show the location of each of the tendons and ligaments in the equine distal limb. 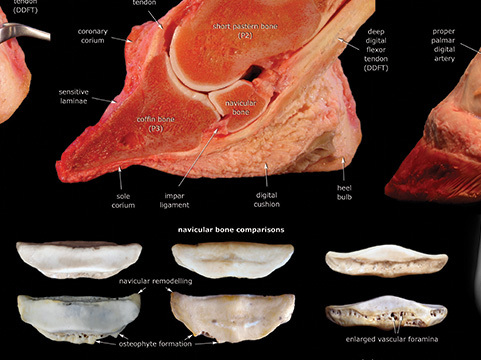 It features both lateral and palmar views, along with an additional palmar view with the top layer of structures removed to show the deeper layers beneath. If you would like any of our other images to be made into a poster please contact us. 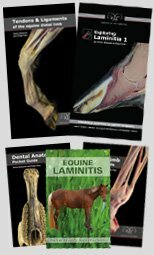 Order any five of the General Anatomy & Vital Signs; Hoof Anatomy; Navicular Region; Equine Distal Limb and Equine Tendons and Ligaments and get the fifth one free!